Novelist Elena Delbanco knows about classical music first hand: Her father, the late cellist Bernard Greenhouse (1916-2011), was one of the founders of the Beaux Arts Trio, with Menahem Pressler on piano and Daniel Guilet on violin. The trio performed from 1954 to 2008 with various personnel changes. 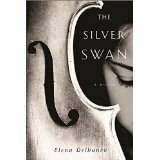 I'm not going to speculate how much Delbanco's father was like cellist Alexander Feldmann, the protagonist of "The Silver Swan" (Other Press, paperback, 232 pages, $16.95), but she obviously was inspired by her dad. Both Greenhouse and the fictional Feldmann own -- or are owned -- by cellos made by Antonio Stradivarius. Greenhouse's instrument sold at auction for more than $6 million in 2012. (Link: http://www.wqxr.org/#!/story/182630-once-destined-city-dump-cello-sells-more-6-million/). It was called the The "Paganini, Countess of Stainlein" and, according to the news account, "gets its name from another former owner -- the violinist Nicolò Paganini -- and it has had a notably colorful history. It was discovered in 1822, being carted through the streets of Milan, Italy in a wheelbarrow, on its way to a municipal dump, according to legend. It has also been copied often, physically dissected and, in the late ‘90s, underwent a painstaking two-year restoration." Mariana Feldmann, almost as renowned a cellist as her father, expects to inherit the Silver Swan instrument on her father's death. She's not been an active performer, but she teaches and gives master classes. Mariana learns when the will is read that she will inherit expert copies of the instrument, but the cello itself will go to a young Swiss cellist. Mariana is viewed by many to be the inheritor of her father's genius, so the disposition of the Silver Swan provokes speculation about Claude Roselle, the cello's inheritor. I'm not going to spoil the story by revealing anything more, but Claude and Roselle learn that the Alexander Feldmann they thought they knew was truly a mystery man. The novel is a magical mystery tour of the world of classical music and prestige instruments, and how they tend to corrupt their rarified world. Elena Delbanco has recently retired after teaching for twenty-seven years at the University of Michigan's Gerald R. Ford School of Public Policy. Before moving to Ann Arbor, she worked at Bennington College in Vermont, where she and her husband, the writer Nicholas Delbanco, together with the late John Gardner, founded the Bennington Writing Workshops. Delbanco has long been engaged in the world of classical music. Her father was the renowned cellist Bernard Greenhouse (of the Beaux Arts Trio), who owned the Countess of Steinlein ex-Paganini Stradivarius violoncello of 1707. The imagined fate of that instrument, upon her father's death, inspired "The Silver Swan", her first novel.